When Kabir’s cousins from Austin visited us earlier this month, they went to a pumpkin patch at Tupelo Buffalo Park. They brought back seven big pumpkins. That evening all the kids rolled up their sleeves, scraped out the seeds and carved their own pumpkins without much help from adults. It was Kabir’s first time scraping the seeds and carving the pumpkin. Arjun painted his pumpkin as he is too small to carve. Each pumpkin looked beautiful. Unfortunately, I had put all the pumpkins outside and in a week’s time, all the pumpkins, except Arjun’s, got so spoiled that we had to throw them away. 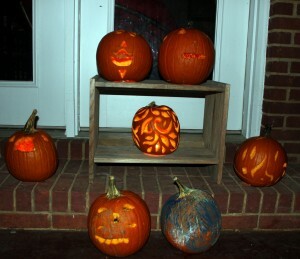 Next time, when the kids carve pumpkin, I am going to keep them inside the house. Pumpkins from bottom to top and left to right: bottom right is Arjun’s painted pumpkin; middle left is Kabir’s; middle center is Shikha’s; top left is Shraddha’s; top right is Advait’s.